Destination Weddings are very popular in Greece, especially during the summertime where the beaches and the landscape of the islands are absolutely gorgeous! 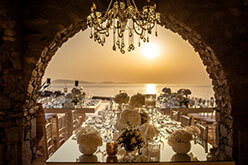 Choose a beautiful, unique destination wedding venue – in the sandy beaches of Mykonos island, on a cliff overlooking the Aegean blue sea, in a charming chapel or in a luxury private villa. Greece offers a plentitude of options in order to find the perfect location for your destination wedding. You can have a reception you desire, whether it’s a simple dinner after the ceremony, a party or a lavish reception in a fancy restaurant. There are numerous alternatives offered to you and we can guarantee for a fabulous entertainment, creativity and a customizable destination weddings package. Our company specializes in destination weddings and we offer a full-service package and wedding planning emphasized on your personal style and specific requirements. The “Twelve Events” specialized team in correlation with our 12 years collective experience, provide us with unique insight and understanding of your special needs for a perfect destination wedding. We are delighted to help and advise you with whatever kind of requests and ideas you may be thinking. Above all, the greatest inspiration of them all is your desire for an excellent destination wedding and our initiative is based on our passion for making your dreams come true. “Wedding Day” Coordinator: Our event coordinators who will help with the overall coordination wedding ceremony & reception and any additional events on site. Budget preparation: This is based according to your requests and the company’s services you are eager to use. Identifying and hiring of wedding professionals andservice providers: (caterers, photographers, videographers, beautician, florists, bakers etc. ), and preparation and execution of contracts. Legal Requirements: Advice as to what paperwork you need before you arrive and answer to any questions you may have. Hotel & Travel: Assistance with selection & bookings of Hotel Accommodations for You and your Guests. Website: A special web page on the Internet posted for your wedding.